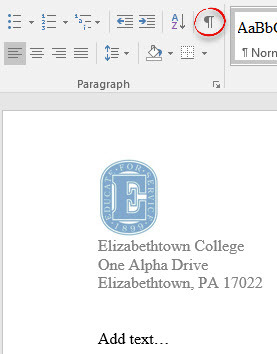 You can create letterhead space or a letterhead in the header of the first page in a Word document. On the second page, you can omit the header and add page numbering for the second and subsequent pages. This process also works in Word 2013 & 2010. Step 1:Create a new blank document.Step 2:Click the Show/Hide button on the Home ribbon. This will allow you to see the page break and delete it. Step 3:Press your [Enter] key a few times, then type "=rand()" and press [Enter]. This provides some sample text. Step 4:Press [Control] + [Enter] to insert a page break. Step 5:Select the Page Layout tab and click the Page Setup arrow in the lower right. 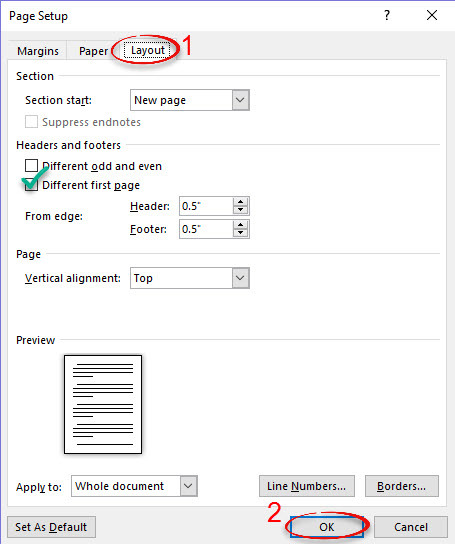 Step 6:In the Page Setup window, select the Layout tab. Under Headers and footers, check Different first page. Step 7:Go back to the top of the document. Step 1:Click the Insert tab. In the Header and Footer group, click Header. Step 2:Choose the header type you want – Blank is easiest.Step 3:Type the letterhead text. 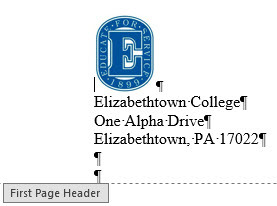 If you just want space, press [Enter] until there is enough room for the preprinted letterhead. Press [Enter] after the text to add space between the header and body. Step 4:If you'd like a logo, add it now. E-Town logos can be found here. Step 5:Note the First Page Header indicator. Under Header & Footer Tools, click the Design tab. Click the Next button to get to the 2nd page header. Step 6:Note the Header indicator. This is the 2nd and subsequent pages header. Leave this blank, you may change the margin if you want. Step 7:Click Go to Footer under the Design tab. Now you are in the 2nd page footer. Step 8:Under the Design tab again, click the Page Number arrow. Choose Bottom of Page, then Plain Number 2. Step 9:The page number appears in the footer. It starts with 2 because this is the second page. Page numbers will automatically increase as more pages are added. Step 10:Close the Header and Footer by clicking the X box. Step 11:Delete the page break and the sample text you inserted. 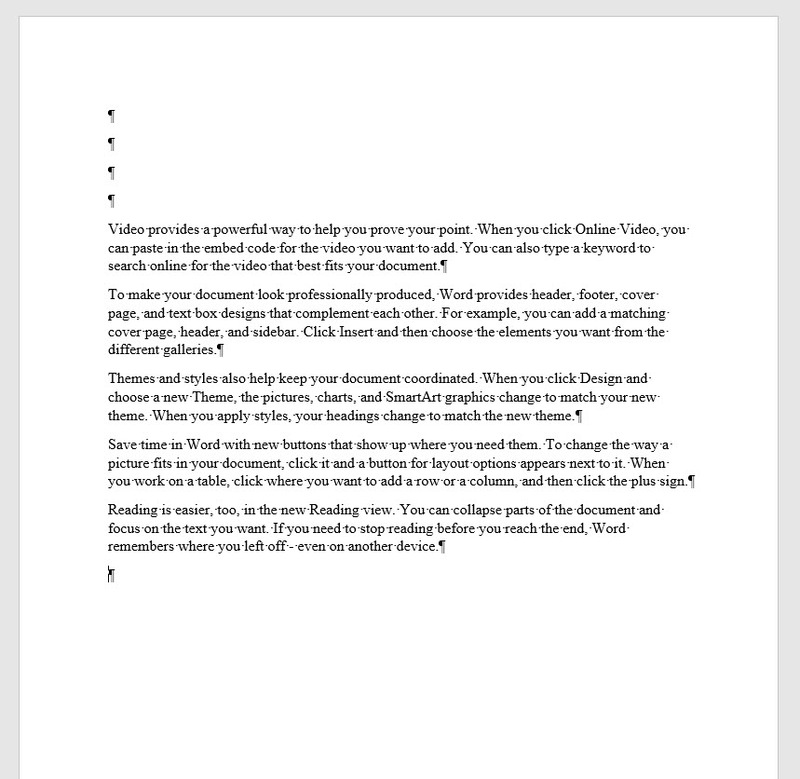 Step 12:Save the document as a template. Give it a meaningful name, like Letterhead. Step 13:Save it in a location that you can find later. Step 14:Close the file. Step 1:Open word. Your template should be under Recent. Pin the template to the list so you will always be able to find it. You only have to do this once. Step 2:Right click the name of your Letterhead template. Choose Open a copy. 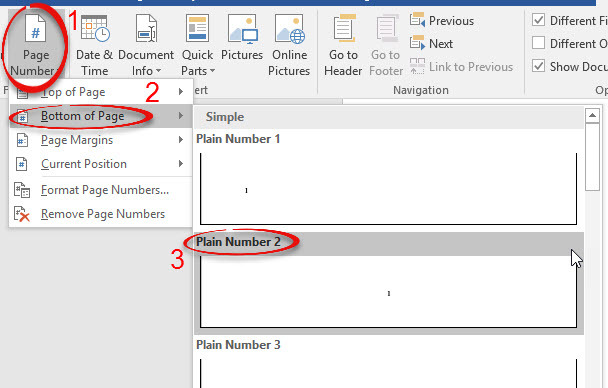 Open a copy makes a document from the template so the template will not be changed. Step 3:Note that the title bar displays a generic name. This file is NOT a template.Step 4:Add text. You may click the Show/Hide button to hide the formatting symbols. When the 2nd page starts, either by typing a lot or pressing [Control] + [Enter], no header appears and page numbering starts at the bottom of the page. Step 5:Save the file – it is saved as a normal document, not a template.